For the first time, Lisson Gallery is presenting an Anish Kapoor exhibition in its Milan space. The show features a series of 14 stainless steel sculptures that have been twisted in order to better reach and interact with light. 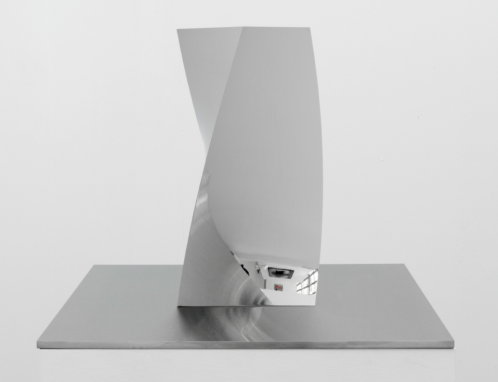 Since 1995, the British-Indian sculptor explores highly reflective surface of polished stainless steel. 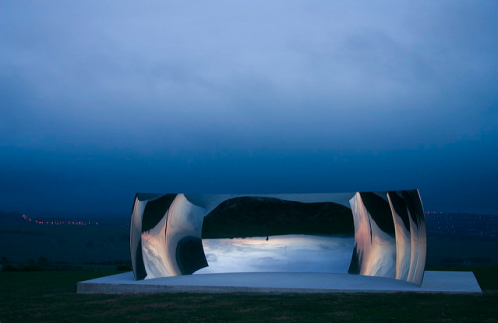 This material and its mirror-like aspect is the main component of two of his most famous pieces such as the monumental Cloud Gate – commonly called ‘The Chicago Bean’ in Chicago’s Millennium Park and C-Curve, first shown in Brighton in 2009 and later in Versailles in 2015. Made out of the same material, the new steel sculptures differ by their form and format. While the C-Curve is several meters wide, the new twists measure 30 cm. They all are twisted to a specific number of degree which give the sculpture an L-shape, a W-shape or a crescent moon. The reverberations and illusions created by the steel disrupt any stable imagery while offering new lenses on the viewer’s surroundings. Up and down, right and left are all confused through these sculptures that reform our common sense of orientation and simply, vision.